The satellite payload will generate and down-link X-band SAR raw data, which will be processed on ground to generate X-band SAR basic products. Both partners will use SAR data and basic products for their respective fields of interest, DLR for standard science applications, Astrium for the commercial market. TSX SAR data for the science community will be made available by the DLR CAF in Oberpfaffenhofen. GFZ Potsdam and the CSR in Austin are collaborating in providing a precise dual frequency GPS flight receiver to the mission to enhance the quality of the scientific SAR products. GFZ Potsdam, the CSR in Austin and the Technical University Berlin are in particular interested and will collaborate in the precision processing of TerraSAR-X SAR data for environmental, geophysical and hydrological investigations. - GeoForschungsZentrum Potsdam (GFZ) in collaboration with the University of Texas Center for Space Research (CSR) provides a Tracking, Occultation and Ranging (TOR) instrument package, consisting of an experimental IGOR-class high-quality GPS tracking receiver and a CHAMP-class laser retroreflector set, and the necessary support for the integration of the instrument package aboard the TSX spacecraft. 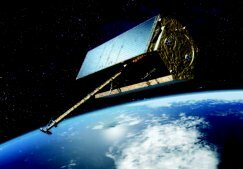 - GFZ and CSR jointly verify the in-orbit performance of the flight receiver and laser retroreflector data and compute high-precision TSX orbits from the validated TOR package data in order to enhance the efficiency of the SAR data processing and the quality of the SAR data products. - GFZ and CSR both collect atmospheric and ionospheric radio occultation (RO) data with the same IGOR receiver for augmenting the global RO data sets as obtained from other LEO satellites (CHAMP and GRACE) to be used for improvements of numerical weather forecasts, climate change studies and space weather monitoring. Derived fundamental atmospheric and ionospheric quantities (e.g. temperature, water vapor) will be used as complementary information for SAR error correction. - GFZ, CSR and the Technical University Berlin (TUB) Institute for Photogrammetry and Cartography use the resulting high quality orbit and atmospheric correction products in conjunction with DLR-provided TSX-X band SAR data for the regions specified in B.1.2.3 for improved scientific analyses. As mentioned before, the primary scientific applications are monitoring the evolution of city surface subsidence, to monitor and model local geologic hazards such as landslides and rock falls and to assess the impact of ice sheet and glacier system dynamics.